— Having religiously read the NY Times dining section for the last 25 years, these two ladies have dominated my view of the food world from their columns and they each have a completely different perspective. Hesser, a visionary, is looking to open new directions and expose the creative side of chefs and cooks worldwide. Fabricant, a nuts and bolts realist, is sharing stories from the street and back rooms of producers and crafts people doing their everyday work. My vantage point in the 5th row gave me a cats eye view of two specific sides of the food business that the Food Lab was exploring. Side A with Hesser on how to dream big and see results through hard work and confidence. On side B the Fabricant panel discussed the means of taking a brand to market through test kitchens, start up concepts, and marketing savvy, requiring dedication to technique and perseverance. 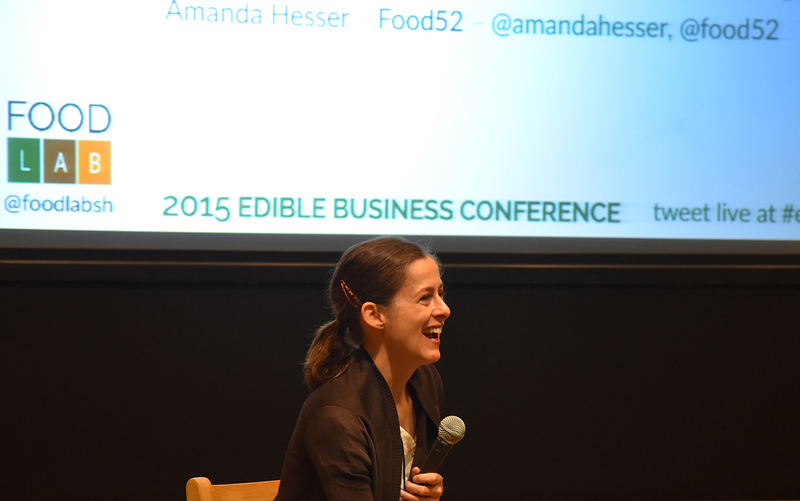 The young Amanda Hesser first told her story, columnist to entrepreneur. Several years ago, in the wake of a celebrated career in journalism Hesser stepped off the page and into the board room, as well as the kitchen, to take on a new chapter in the food world as an online entrepreneur. She touched on her first plan momentarily and then went directly to Food52 which she started with a friend in her home kitchen in 2009. As she worked her way through the details of building an online magnet focusing on food she described her challenges and the tears followed by months of frustration related to Food52’s launch. It was inspiring to hear her describe the emotional challenge that ranged from initially vying for venture capital attention, to round 3 when the tables had turned and she and her partner now consider what the investor will bring to the table beyond the core funding. Had I been given the chance to ask questions, mine would have been focused on the division of church and state between editorial product (recipe and kitchen suggestions) to merchandising and online product sales. Full disclosure here, I’m a Food52 customer and have found the products they offer to be unique and interesting. While the food photography is attractive and inspiring, my time is limited and I haven’t even opened a recipe file. That said, I’m not sure if it matters, if Amanda runs the show and likes a product that’s featured in her catalog of products, using those products in recipes and highlighting their application as tools shouldn’t be questioned as it might be in print. She told us how round 3 funding has brought investment in Food52 to $9 million, then went on to say that while that’s a lot of money to her it’s small potatoes in the big picture and her investors have much bigger stakes in other categories, however it seems to be a huge incentive for her to protect and build her e-commerce brand. 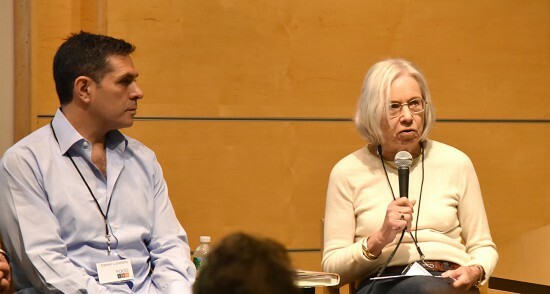 The Hesser interview, conducted by author and columnist Jessica Soffer was a well positioned introduction to the much more nuts and bolts food business seminar to follow lead by Florence Fabricant. Fabricant ran a panel of 5 successful entrepreneurial men. 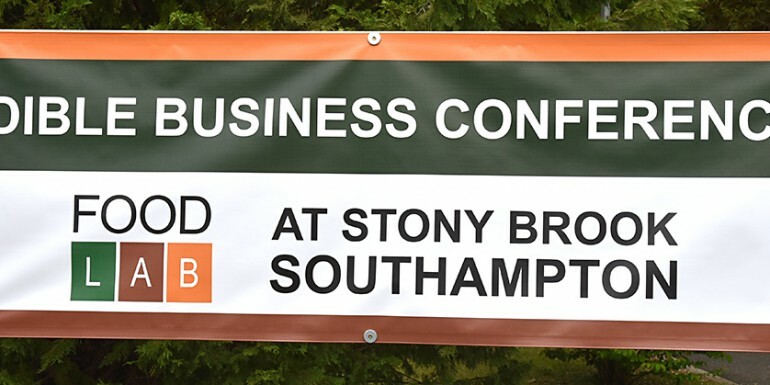 The title of the second presentation was “Growing a food business” and I had made an effort to attend to hear Andy Arons from Gourmet Garage speak. Arons went on to reinforce the importance in sell through, he pointed out one of his new favorites Good Culture cottage cheese, a multi flavored line that’s finding a ground swell of support, why—because the product is high quality, inventive and packaged expertly to compete on the shelf with yogurt and other high volume products in the dairy case. Joe responded by directing the conversation to co-packers. His products are presently manufactured in his own facility, hand packed by 2 employees and delivered by a team that works for him. He and Liza oversee most every step on a daily basis, handing the details of several flavors made with top quality products and often locally raised fruit would require a great deal of trust in an outside firm. He pointed out that an investment in larger machines and cold holding facilities would be a challenge in this market, handing his prized product over to a firm off the island would be a big risk. At this point Tanner reinforced Joe’s view saying “co-packers can cut cost by cutting quality” once the first few runs are through the facility, recipes can be adjusted to increase the bottom line for the producer. Andy Arons added that “converting to a large minimum run can be difficult, discipline and consistency are critical”, he referred to a project he worked on with Cesare Casale, a highly regarded Italian chef who was in attendance this morning. They had tried to recreate a pasta chip recipe that Mr. Arons had enjoyed at the bar of one of chef Casale’s restaurants. In the end, the type of semolina used in small batch production was different than the type that a co-packer would use in larger batches and the quality level just didn’t hold up. Then Daniel Lubetzky, the owner and developer of highly successful brand Kind Healthy Snacks added “Industrial grade foods are fine but they loose their soul. I want to recognize what I’m eating and emulsifying won’t accomplish that goal.” This comment followed a short description of the years Mr. Lubetzky had spent in a windowless basement developing a product line that now boasts over 30 flavors. The Kind brands success has been based on the premise that healthy snacks can be distinctive and flavorful. The group agreed when both Fabricant and Lubetzky echoed each other in the statement that the opportunity in new products is in developing ideas that don’t exist in the market yet. 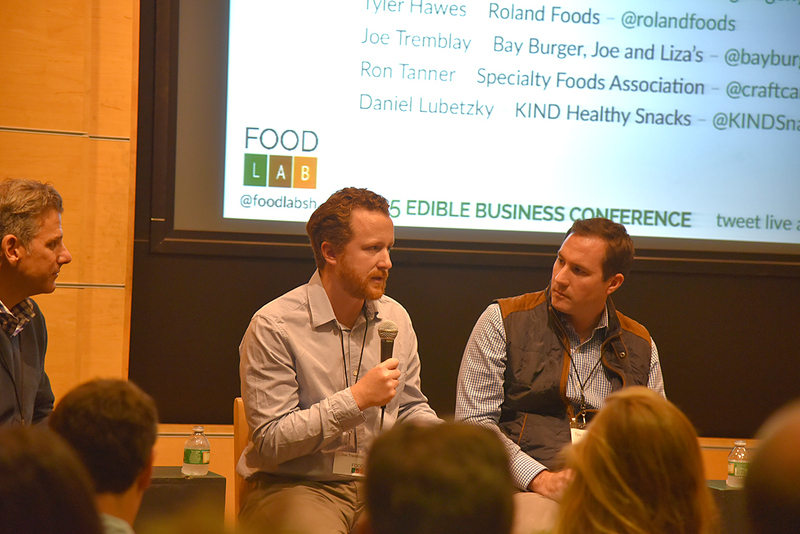 When the panel shifted focus to marketing and building brands, Tyler Hawes of Roland foods said while P.R. is important, first a brand needs to be built by a “scrappy entrepreneur, someone hungry enough to show up at events, getting the brand on the street, using a grass roots approach.” Building a brand also requires a long range view when pricing at the beginning. Selling a bottle of sauce at a local market might be a good start but you can short change the long term if the price isn’t established early to absorb the add-ons that a co-packer and then a distributor will require. The example was simple, bringing in partners in distribution will bracket sale force margins and compress your profits. Charging, say $10 at the direct market then the distribution effort taken on later on might cost so much the delivered product will get back a payment of $4 per unit. Scaling up has to be considered early. Establishing a sampling ground in a true market is very important, better than a small, local or even home environment. My take away from the first Food Lab was worth celebrating. For several years the question of bringing Estia’s hot sauces to market has been battered around across our tables. Today’s seminars reinforced the points that have been running through my mind since the first tasting. We will need to establish a relationship with a manufacturing team that we can rely on, package the product effectively, work long hard hours on marketing, tasting and building the brand and finally and most importantly, price it so we can see a profit on the bottom line once a shelf position is established.